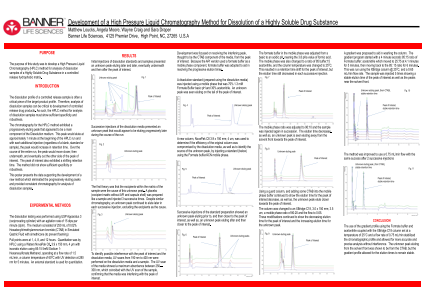 Abstract: High Pressure Liquid Chromatography (HPLC) for Dissolution testing is a critical component to development, as well as, stability of a manufactured drug product. Dissolutions incorporating hydrophilic matrices dissolve more readily in water, aiding in drug substance solubility. However, drug products formulated in hydrophobic matrices lack an affinity for water, inhibiting solubility. Dissolution medium additives (surfactants) lower the surface tension between the matrix and medium, aiding in solubility. The solubilized solution is measured to quantify the amount of drug substance present. Surfactants can be problematic for sample analysis. An HPLC method showed an unknown extraneous peak, resolved from the peak of interest, but losing resolution with each proceeding injection (regardless of blank, standard or sample). Throughout the run, the extraneous peak would elute later and later, eventually after the peak of interest, which appeared to be losing retention itself. Initial method conditions were isocratic using a high flow rate (1.5 mL/min), high column temperature (60°C) and a C8 column. Experiments were conducted to determine the extraneous peak source, as well as, resolution and retention loss. Dissolution medium injections showed the extraneous peak, and the shifting retention times. Differing isocratic compositions, surfactant in buffer, and a gradient profile using differing flow rates, various column temperatures, and differing columns were evaluated. The extraneous peak and retention shifting was determined to be from a surfactant necessary for sample dissolution. A new method using different mobile phases and gradient elution, flow rate, column, and column temperature, eliminated the shift in retention for both peaks and provided consistent method specificity and analytical chromatography.